I love how well this top tucks and stays in place! 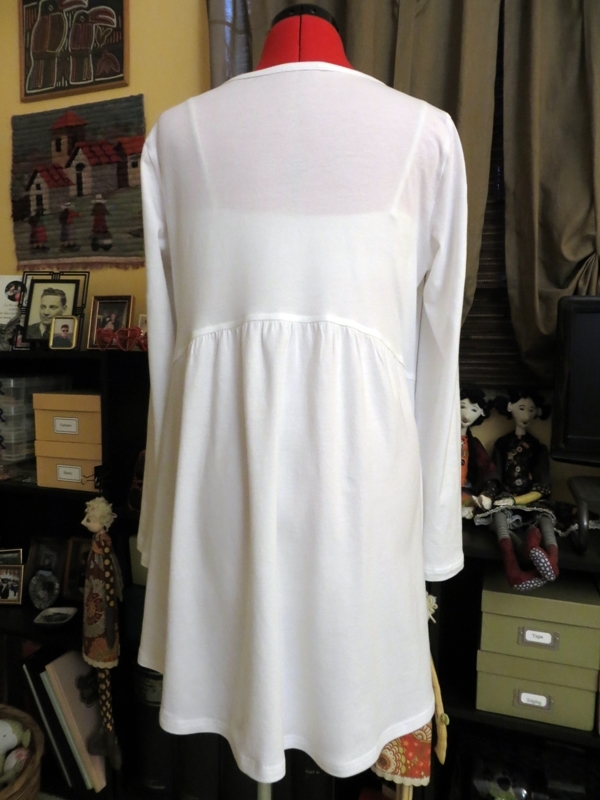 I sewed View A, size 12, with no changes. I marked every single notch and circle from the pattern – and used them all. Just to share, I use a piece of calico as a pressing cloth for knits, and I seldom get pressing lines. 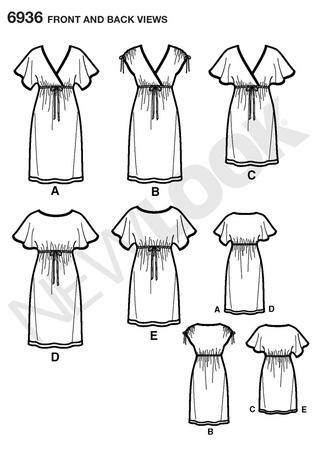 A tip – those long front edges are curved and have a narrow hem. 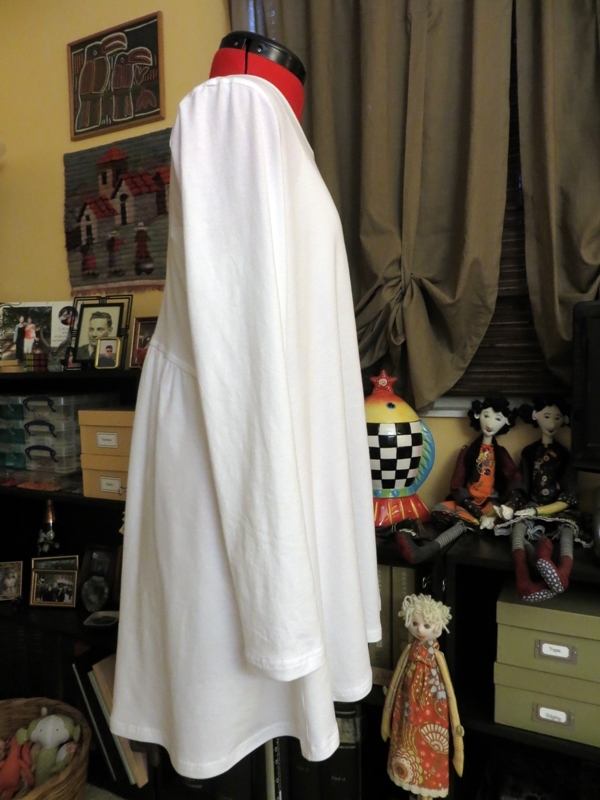 It’s tempting, almost natural, to stretch it out as you pin and sew…but don’t! You’ll end up with a distorted and wavy edge. Kind of shake out the fabric so it finds its way, and let it guide you. Late breaking news: Preston’s soccer team won their league championship game today, and he scored a goal!! Breaking the rules…I had a fantastic shopping spree this morning at Fabric Mart. They have their pre-cut fabrics and fabric kits on sale. This might be my best fabric sales/order ever. A little over 24 yards of fabric for $54, with shipping! And New Look 6150 ruched knit tops (perfect for tucking into pants and skirts)! I love Fabric Mart. Great service, shipping, fabric, and specials. I’m getting dangerous with all the fabric and pattern additions to the loft this year. Wowser! Now that’s a long title! I’ve never used this fabric before, mostly because it just sounds warm. Actually, it’s really similar to poly/lycra ITY knit – smooth, thin hand, nice drape, and no wrinkles. 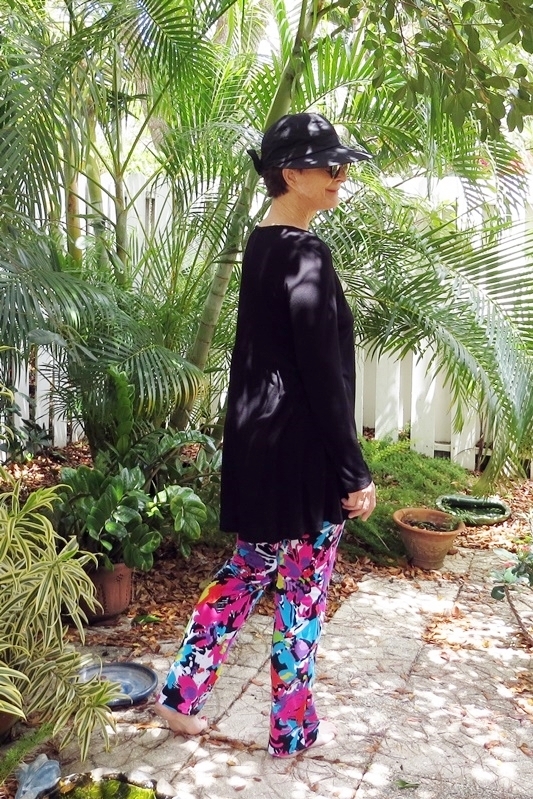 It seemed perfect for a pair of Love Notions Sabrina Slim, my favorite legging pattern (here). For this pair, I went down a size, to a 12. If I went by my measurements, I would use size 10, but I don’t wear skin-tight pants, so the 12 is perfect. As with my previous versions, I modified the leggings to drop straight down from just above the knee. This prevents any twist in the lower leg, and I just like the way it looks. 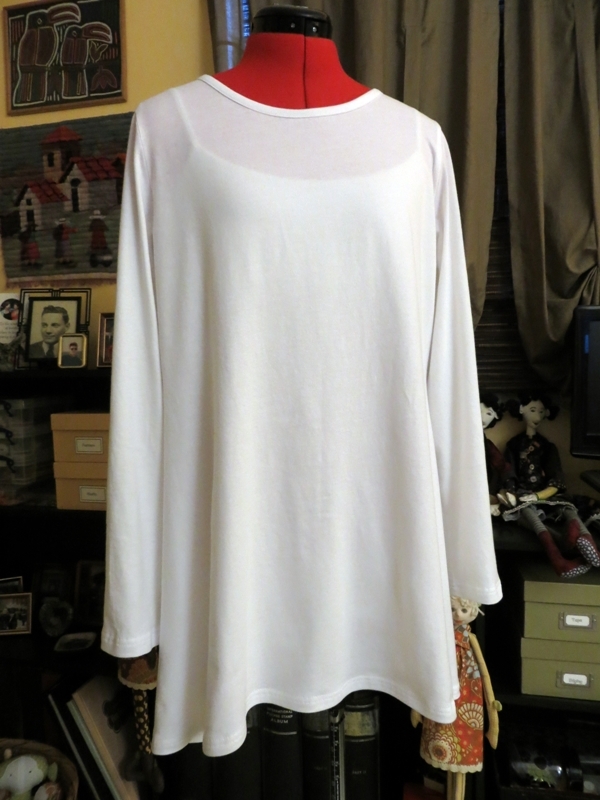 I also added 1″ to the 30″ hem line. One of the nicest features of this pattern is the wide (2″) contour waistband. Beautiful fit. I use knit elastic, which I order in 12 yd rolls from Wawak (here). I love knit elastic! It lays flat when it’s stretched, and it can be trimmed to a more narrow width with no raveling or fraying. This roll is a great bargain, compared to small yardage packs. I leave the waistband facing seam open, and insert the elastic there, after the entire band is serged to the pants. BTW, this is how I insert elastic for everything. 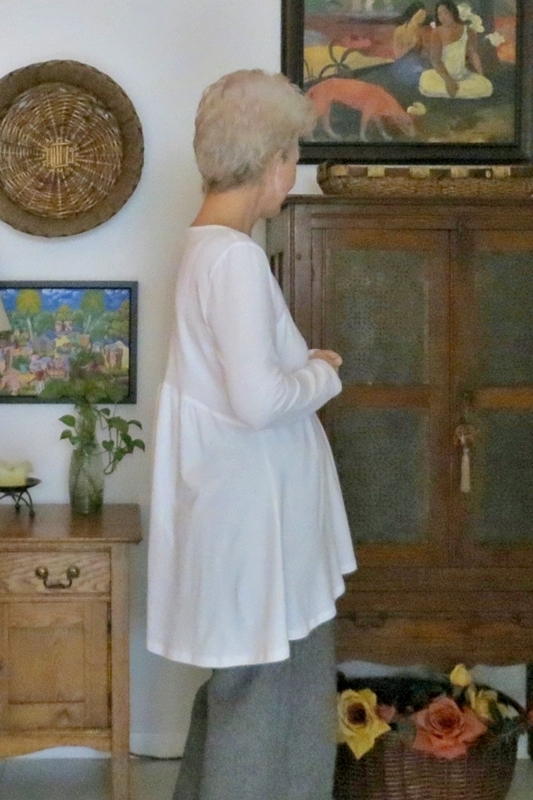 This tunic and Butterick 5954 are officially my go-to patterns for knit tunics. A love affair! 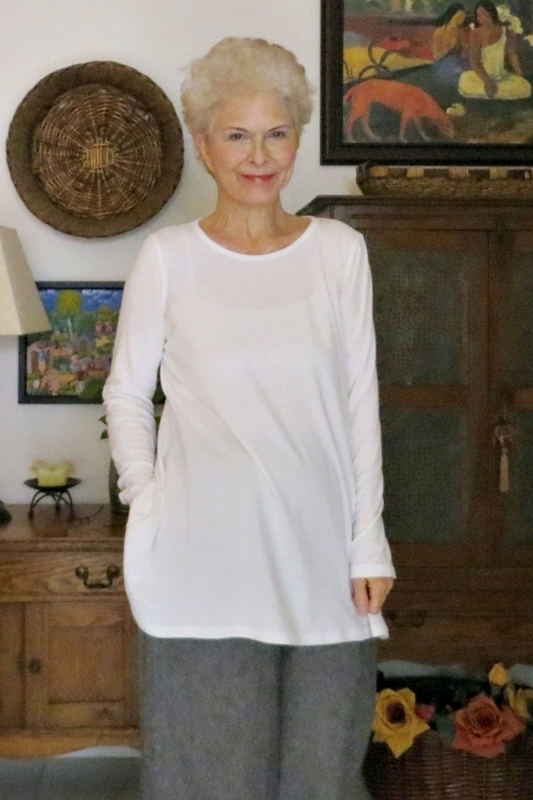 I used view B: gathered back, long sleeves, and a bit of sharkbite at the side seam. BTW, I tried to find this pattern online so I could supply a link. 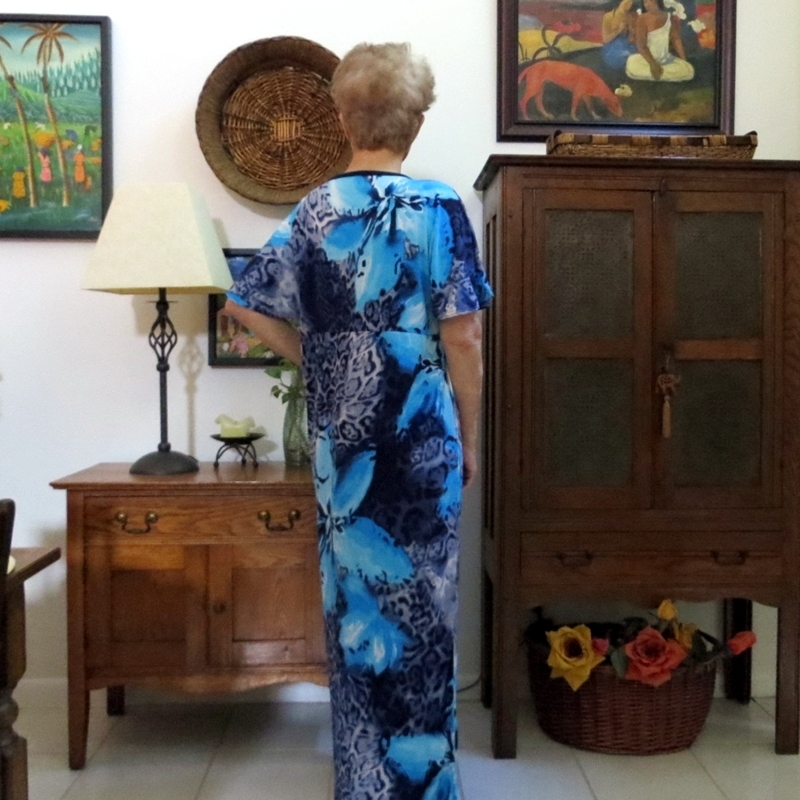 And it must be getting scarce – it’s not on Pattern Review or the Simplicity site. But it’s still on SewingPatterns.com. And the hi-lo hem is just about perfect. Unexpected and so much fun. This is size 12. My very first version, in lagoona interlock, was size 14, and it was just too big for me. This wonderful fabric is a cotton/rayon jersey from Fabric Mart. It has 80% stretch horizontally and 10% along the selvedge. Fabric Mart doesn’t give fabric weights, but I would put this at 6 – 8 oz. It’s not sticky (the bane of cotton/spandex), due to the rayon content. 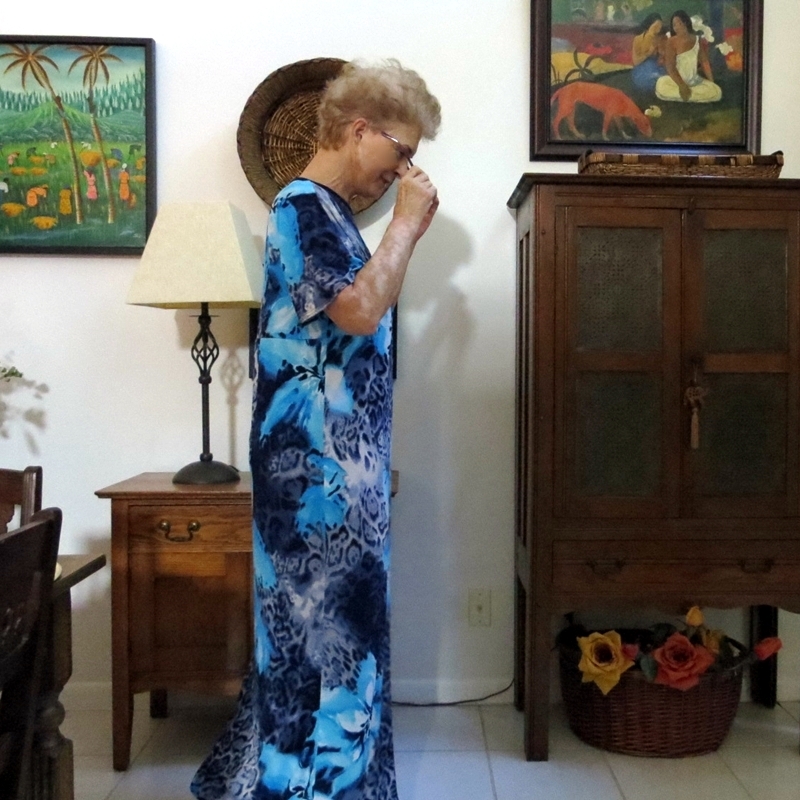 I’m wearing my Essex linen/cotton wide-leg pants in the pics above. 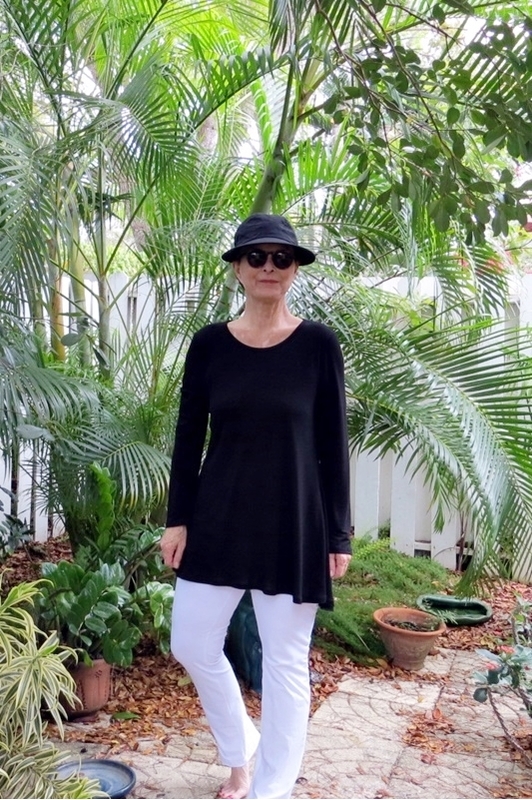 But this tunic is also great with my Love Notions Sabrina Slims. The black jersey is 6.5 oz. and has 50% horizontal stretch. I hope it comes back to GC, it’s so nice for tops. 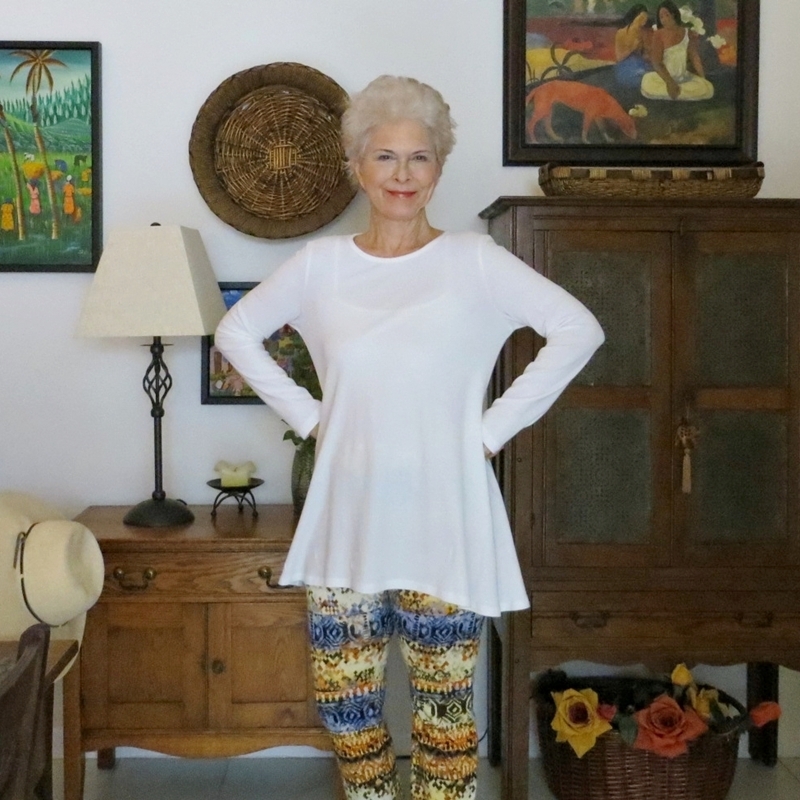 Funny story: I wore the outfit below to my annual checkup in May – when my doctor walked in, she said “you’ve lost weight”. Nooo, but I’ll take it! So – Election Day tomorrow! 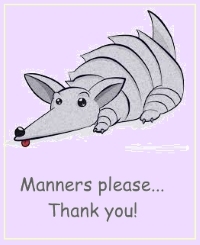 I voted by mail several weeks ago, rather than try to stand in line with my cane (would they take it away at the door?). I find voting to be so empowering and levelling at the same time – the country feels like a small community when we do this. Edited to add: Stirswatersblue on Pattern Review let me know that this pattern has been re-released as New Look 6439 – and sure enough, the exact pattern! I’ve been on a bit of a quest lately, trying to get the upper hand on all that fabric stashed in bins in the loft. Because so much of it is pieces and bits. Why have I been keeping it all? My first move was to take a critical look in my closet, which is home to fewer garments than it housed in January – the result of my closet bust and donation gig. But what about those things I really like, mostly because of the fabric, but don’t wear? I’ve taken my favorites and actually redrafted/resewn a lot of them. Whatever didn’t make the cut got tossed. For good. When I say tossed – I donate anything that’s wearable. What doesn’t suit me might be a glad find for someone else. Anyway – this morning I pulled out the bin that’s dedicated to knit ‘scraps’ and remnants. And I came across a whole dress! I made this for Jungle January 2016. But I guess I didn’t like it 🙂 I’ve made it twice in the past, 2012 and 2013, and liked both dresses. I donated the short version from 2012, because I just didn’t wear it, and I had no occasions in the offing. But the 2013 version is still in play. Now – this one. 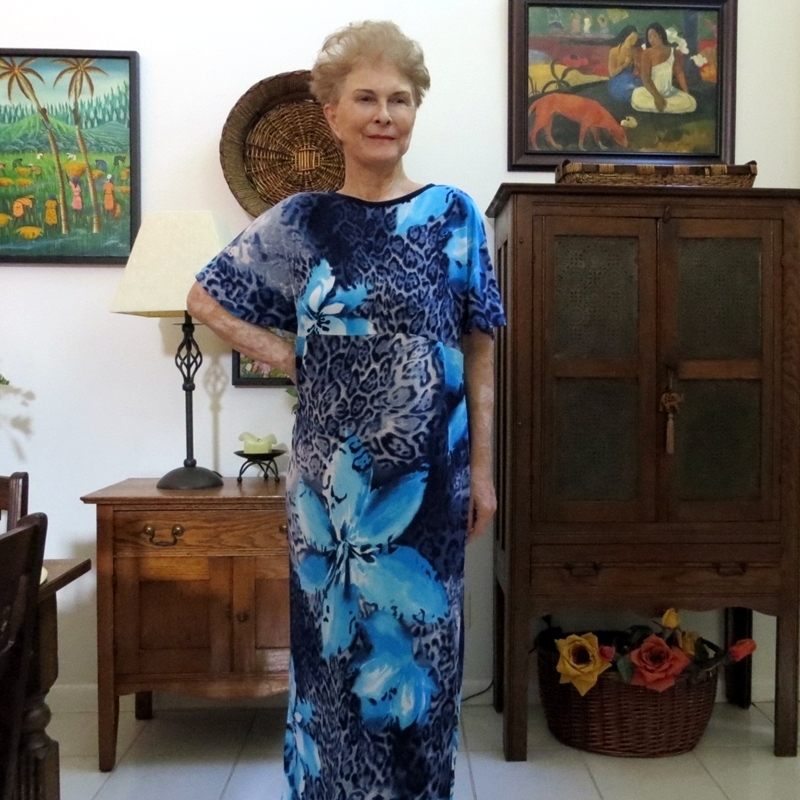 I pulled it out – it was totally put together but had unfinished sleeves, hem, and waist casing. And an incredibly high neckline! I trimmed the latter, bound it with navy poly crepe, and attacked all the rest. 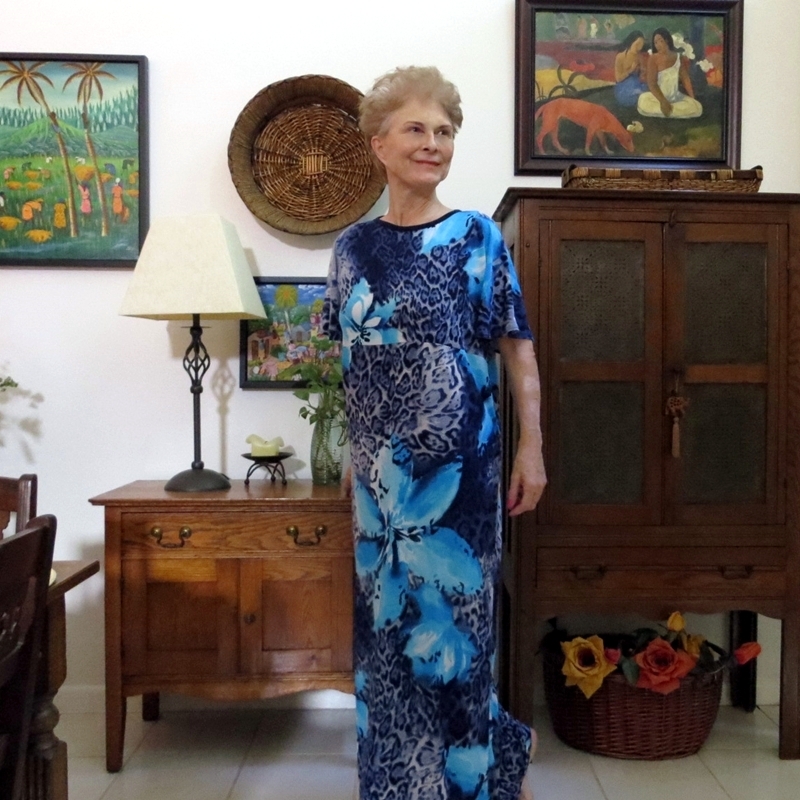 And voila – a dress I really like. In fact, I’m wearing it as I write. This ITY knit jersey is from Fabric Mart, and I had 5 yards with which to work. Which was a good thing, because I didn’t want to end up with a very large lily splashed across the girls or my fantail. Large prints can be a real challenge! But I think I handled this one pretty well. So, mark one up for a great save…this is perfect for home, very comfortable, keeps me just warm enough. While messing around in that bin, I found loads of ITY remnants that would work together. 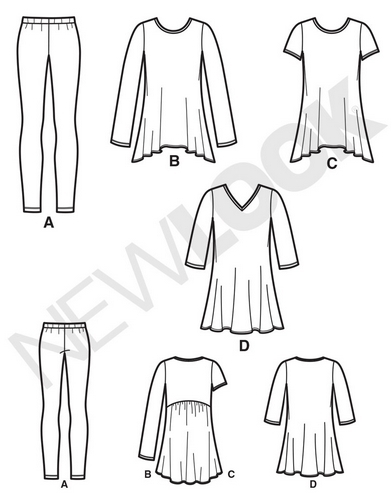 So now I’m think about doing a version of Marcy Tilton’s Vogue 9108, which includes the top, dress, and leggings. 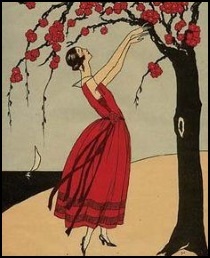 I bought the pattern when it came out, it’s one of the few Marcy Tilton art-to-wear patterns that I really like. What fun piecing ops and such becoming lines. However, even this one has some features that I’ll decline – like the back treatment. Looks great on the model, but I cannot even imagine how those straps would work for me in real life. I’ll try to capture the lovely lines of the back skirt, in a back bodice that’s comfortable and wearable.